Hamdan Buti Al Shamsi is a self-taught photographer, graphic designer, and writer. He has participated in a number of group exhibitions around the United Arab Emirates, including in Abu Dhabi and Dubai, as well as in the United Kingdom and the United States. Recently, Al Shamsi received the Salama bint Hamdan Emerging Artists Fellowship, which is organized in partnership with the Rhode Island School of Design. He also teaches courses in photography with the Abu Dhabi Educational Council and digital college workshops at FUNN: Sharjah Media Arts for Youth and Children. Al Shamsi currently lives and works in Al Ain. Hamdan Buti Al Shamsi combines vintage photographs and newspaper clippings with abstract geometric forms inspired by modern architecture for his digital works. For Harmony, he employs a technique known as photo transfer to manipulate images of his ancestral home, Al Ain, the second largest city in the emirate of Abu Dhabi. Al Ain, which means “the spring,” was once an oasis that served as a vital water source for travelers following a caravan route from Oman to the territory of the UAE. Harmony features the city’s prominent landmarks, such as the Al Jahili Fort – a structure erected in the late nineteenth century to defend Al Ain and its prized palm groves. 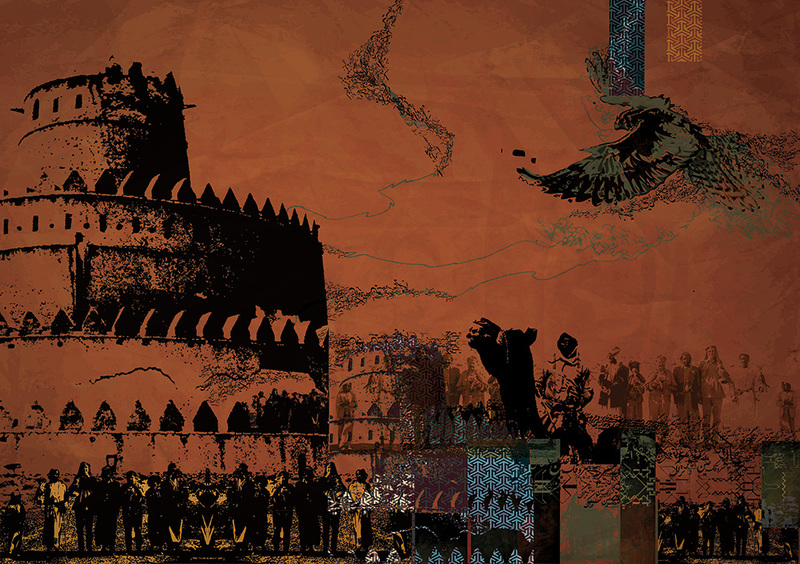 The artist also alludes to the popular Emirati pastime, falconry, with the inclusion of the bird on the right.